A few people may know that an ABC Dance usually stands for anything but clothes, which usually involves wearing outfits that are made from various materials. The CSUSB ABC Dance shares its name with this, but at CSUSB it stands for anything but casual. 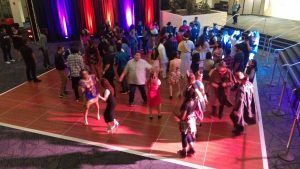 The event brought the night alive at the San Manuel Student Union with good music and allowed students a place to mingle on April 14. The CSUSB Program Board held ABC Dance, a Halloween event in the spring. As time went by, more and more people joined the dance floor at the ABC Dance. a theme and we had never done an ABC Dance,” said Leslie Delgadillo, Program Board Student Assistant. Delgadillo said that a co-worker who liked the original type of ABC Dance gave the name for the event. She also said that the dance was also given this name in the hopes of bringing in more people to the event. The event was free for CSUSB students and any guests that they wanted to bring. They had free water and glow sticks for participants at the dance. No matter what music a person liked, DJ Swiff tried to offer different kinds of music. it,” said Denise Kollock, a second-year student at CSUSB who along with her friend Jessica White, a third-year friend at CSUSB, were in matching cat ear outfits. Even though the ABC Dance was advertised as a somewhat Halloween in spring, it was not necessary for students to wear costumes, though a few did. This was the first year that the ABC Dance had been held, and it saw a decent turn it out in terms of students. Cristian Ortiz, DJ Swiff, providing a good mix of music at the ABC Dance. pumped [that] this was something I was going to be apart of,” said Cristian Ortiz, who provided music at the event under his DJ name DJ Swiff. Ortiz, as well as being a DJ, is a student at CSUSB and a member of Output DJ’s Club on campus. He has had a long-time interest in music and has always had a dream of being able to DJ and provide the music for an event at CSUSB. At the ABC Dance, Ortiz kept people pumped with music from the start to the end of the dance, despite occasional technical issues. 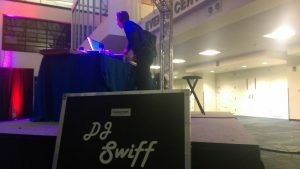 “[DJ Swiff] tries to connect you with different types of music, it makes you remember the past, the present…I like to mix new things and old things and just make people happy,” said Ortiz. Ortiz hopes that the campus will give him more events, and more opportunities to DJ. He would be happy to give more to a school that had given him a lot. Though the ABC Dance has passed, students that would be looking for a free fun event should keep a lookout for other CSUSB Program Board events like the ABC Dance.